Corns always make the horse lame. There may be intense soreness, as in suppurative corns, or slight soreness, as in dry corns. Old horses, having chronic corns are so much used to the pain that they limp very little, especially if both feet are affected; still such horses are generally restless and move the feet about. In suppurative corns the lameness is soon over if the abscess is opened. In such cases where the injured tissues are much inflamed the heel of the affected side is hot and sensitive, the whole foot, of course, is tender in sympathy. In dry and chronic corns all evidence of local fever is wanting. When corns are suspected the foot should be examined for increased sensibility of the inside heel. Grasp the wall and the bar with the hoof tester, and if the horse has corns he will flinch. For further evidence remove the shoe and cut with the knife at the seat of the corns. As the sole is pared out in the angle it will be found colored and stained red with the escaped blood. The discoloration in suppurative corns is less marked than in dry corns. In suppurative corns the horn is colored gray or white, stringy and often mealy. The difference between suppurative corns and other is that the inflammation in suppurative corns ends in suppuration. The pus collecting at the place of injury, escapes by working a way between the sensitive and insensible laminae at the coronet. Cases of this kind are serious, for they may cause gangrene. If the disease is caused by fast driving on hard roads there should be rest given, and the feet should be placed in cold water to soften the hoof and to allay fever and inflammation. If the cause is contraction, the feet should be packed in boots to soften the hoofs and give them a chance to spread. If any of the above causes have produced suppurative corns, remove the loosened sole, so that the pus will freely escape. 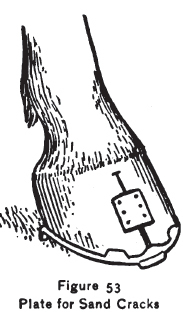 If the matter has worked a passage out at the coronary band and escapes between the band and the hoof, then cut an opening on the sole so that the pus can work down. Bathe the feet for a day or two with cold water made astringent with a little sulphate of iron. If any complications should arise and gangrene set it, it is best to call an old veterinarian. In all cases of corns, packing or poultices should be applied to soften the horn and spread the foot. Moist corns should be cut out, and balls saturated with pine tar put into the hole and changed every day until the corn is healed. In all cases of corns keep the feet soft. There is no need in cases of dry corns to cut them out. On the other hand it is better to leave as much of the sole as is possible, and not touch the sole, for the dead sole will retain moisture and help to keep the foot soft, which is most important in all cases of corns. There is no such thing as shoeing to cure corns. The best that can be done is to shoe to relieve pain. For moist corns a rubber shoe will sometimes be found convenient as soon as the foot is in a condition to receive a shoe. The wall directly over the corns, as well as the sole, should be lowered so that there will be no pressure over the seat of the trouble. 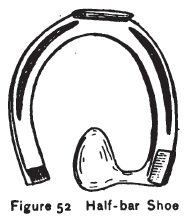 After the foot is healed a half-bar shoe, as shown in Fig. 52, should be used. 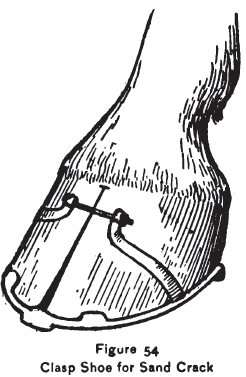 In using a shoe like that, the bar of the shoe should rest well on the frog, and all bearing over the corns taken off. For moist corns, shoe as for suppurative corns. For dry corns, and when the horse is to be driven every day, either put on a heavy shoe or a half-bar shoe; the bar to rest on the frog with no pressure directly over the corn. The shoe should have short but sharp calks, and the feet should be packed so as to keep them moist and prevent contraction. Sand cracks are generally of two kinds: toe cracks and quarter cracks. The toe crack is a crack running from the toe upward, and in most cases up to the coronet; while a quarter crack is on the inside quarter of the foot. The inside quarter is more liable to this injury than the outside, for the reason that this side is thinner, and in locomotion receives a greater part of the weight of the body than does the outside quarter. The causes of sand cracks are many. Predisposing causes are: hard and brittle hoofs with no elasticity, brought on by poor assimilation and want of nutrition to the hoof; hot, sandy and hard roads, also wet roads, which wash the natural substances out of the feet, making them brittle. Shoes with toe clips, large nails, together with such diseases as suppurative corns, quitter, grease and canker, are also causes of sane cracks. Heavy pulling on hard and slippery roads, fast running and jumping, sometimes blows on the coronet and calk wounds are incidental causes. The lameness of sand cracks is generally slight when the horse is walking, but the trouble is greatly aggravated when he is running. The toe crack closes when the horse stands on the foot, and opens when the foot is raised from the ground. In the quarter crack the opposite is the rule. Preventive measures consist in keeping the hoof soft by freely using hoof ointment or packing the feet in boots for the same purpose. The evil of jumping and fast driving must also be avoided. When the crack is first noticed means should be adopted to prevent it from growing deeper and larger. This can only be done by arresting all motion in the edges, and for this purpose there are different methods practiced. The Wachette clasp, as shown in Plate 33, is often used with good results. These clasps and instruments are sold by makers of veterinary instruments. The cracks can be closed by nails, as shown in No. 6 of the same plate. A plate of brass or iron can be made and put on with screws, as shown in Fig. 53. In all cases of sand cracks there should be a heavy enough shoe to hold the foot from spreading and a bar shoe with toe clips on each side of the toe for toe cracks, as shown in Fig. 53. The clips should be at the quarters if it is a quarter crack. 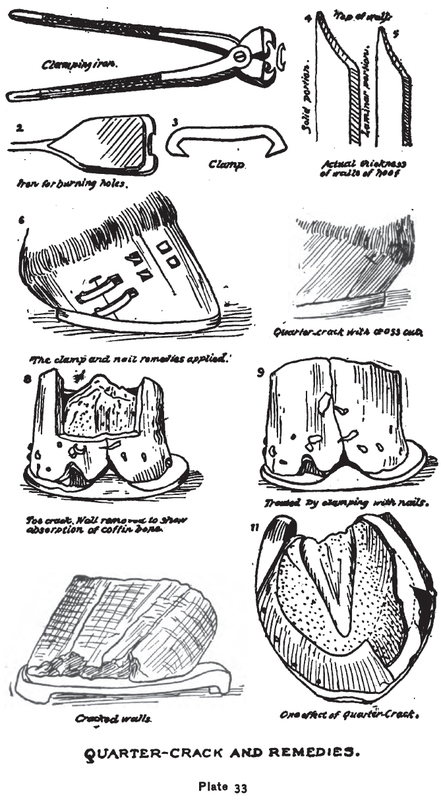 At the upper end of the crack a cut should be burned across the crack, as shown in Fig. 53, to help start the growth of the new hoof. In Fig. 54 a bar shoe is shown, with bands welded at each side of the shoe, and through the ends of these goes a bolt with which the foot can be bolted together, so that the edges of the cracks will meet. This shoe is also provided with toe clips, and it is the best shoe devised for sand cracks. If the crack is deep and the flesh projects out between the edges of the crack, let a veterinarian burn it off. In shoeing for sand cracks use and endless bar shoe, to prevent the foot from spreading. The shoe should also have sharp calks to prevent concussion and jars.